Sometimes, being the Director of Learning and Visitor Engagement can be very stressful-trying to meet deadlines, meeting school groups, developing education resources. Many days are harried, many days are just plain FUN, and at the end of the day- our work is about making those meaningful connections. Let’s go back to last Thursday. The school group from the NAF Academy has arrived at the JMM – their visit includes a tour of the historic synagogues, where the students will learn about the different immigrant groups that used the building and about Jewish rituals and traditions. The students ask great questions and enjoy learning about Judaism and Baltimore history less than 1 mile from their school. This group was the first group of students that went through Amending America: The Bill of Rights. The students were given a gallery guide to help them self-guide through the exhibit. The students were engaged as the meandered through the gallery. I looked up and I saw one of the students call out to his buddy, “Hey, get a picture of this!” I looked up and instantly- a smile came to my face- this student saw himself at the March on Washington D.C in August 1963. 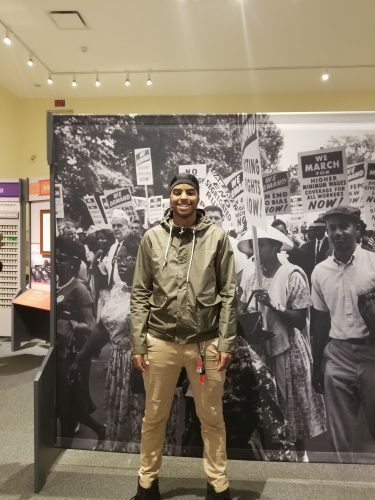 He was connecting to the exhibit, he saw himself as one of the protesters marching for civil rights back in history! Our hope is that students find personal connections to our exhibits. Less than 15 minutes after the group left, I hopped in my car and headed to John Carroll High School in Bel Air, Maryland. John Carroll is a Catholic High School in Harford County and the JMM has a strong relationship with the school. 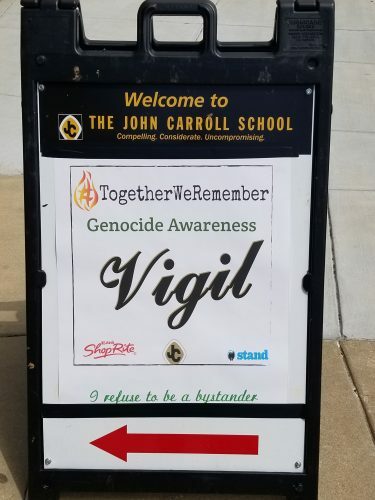 We were invited to be a part of the #TogetherWeRemember program that honors the millions of victims that were killed during the Holocaust and other genocides that have occurred in our lifetime. #TogetherWeRemember combines, technology, art, and activism to transform remembrance to of past atrocities into a powerful tool for building peace in the present. I went up to John Carroll because I volunteered to be a reader of names of victims. Never would I imagine that reading the list of names would be so incredibly powerful. 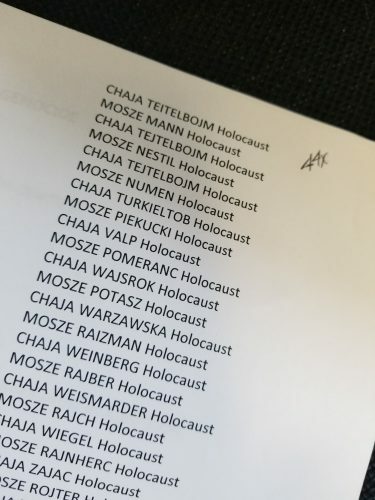 I was given a list of about 100 names, all who were victims of the Holocaust. As I began to read the names, I noticed a common thread, the first names were either Moises, Chaim or Chaya. In fact, these three names were the only names that I read for the 10 minutes. As I got further in the list, it struck me that I kept repeating my own Jewish name, Chaya. In fact, I repeated the name 44 times throughout the 10 minutes. I got off the podium, slightly drained and emotional. I was thinking about the 44 women who perished during the Holocaust- their families- and if anybody ever says their name and remembers that they once lived during the 20th century. So powerful. This Thursday, April 19, 2018, you can be a part of this powerful program too as the JMM is hosting a #TogetherWeRemember program @ 7:00 p.m.
Sign up, bring a group of friends, make your own connections and be a part of this transformative program.